Early chiropractic assessment and treatment after a motor vehicle accident will help minimize injury and reduce pain and improve recovery times. 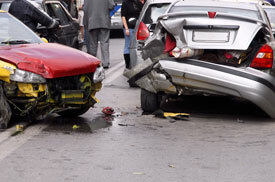 We are specialists in treating soft tissue injuries associated with motor vehicle accident injuries. We recommend booking an appointment within 48 hours of the accident since an early diagnosis and treatment will ensure best results. Providing you have a GP referral and your insurer is notified your treatment will be funded by your insurer and at NO COST to you. If you have any of these symptoms or questions regarding the process of the motor vehicle accident or Sydney chiropractic treatment, please contact us and we will be happy to help.